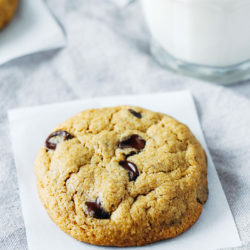 The Best Vegan and Gluten-free Chocolate Chip Cookies- made with a combo of oat flour and almond flour, these cookies have a delightful chewy texture. You would never guess they’re made without refined sugar, starches or gums! I usually like to post healthy things on Mondays. I also try not to share two dessert recipes in a row. But to keep these chocolate chip cookies to myself for another day would be a SIN. I’ve already waited too long and I just can’t help myself at this point. Plus I figured with Valentine’s Day tomorrow this recipe could be my gift of love to you. I made the whoopie pies to have something festive and cute but if I’m being totally honest, I rather give you these cookies. They’re pure magic. 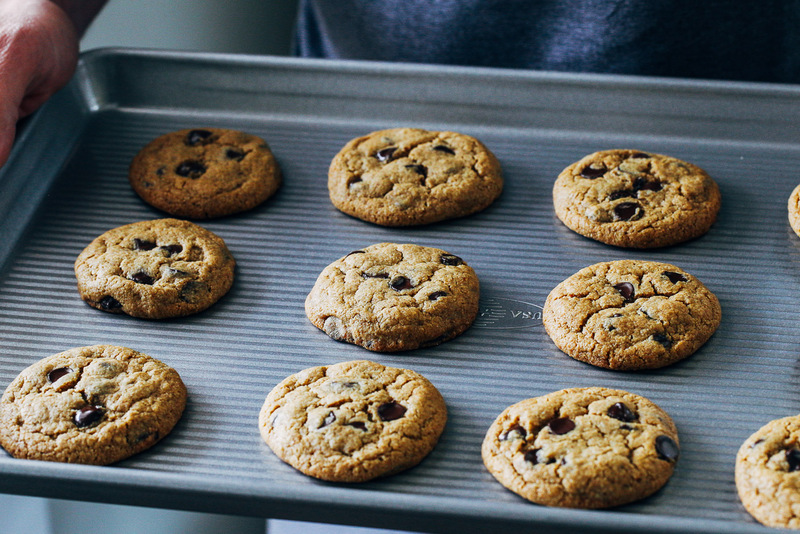 By using a stand mixer with solid-state coconut oil we’re able to whip tiny air molecules into the oil which allows the cookies to spread beautifully when baked. If you’re averse to coconut oil, this process also works with vegan butter. The texture is softer with coconut oil and slightly crispy with vegan butter (although they don’t spread as much with the butter). Sometimes I make them with a mixture of both for a cookie that’s somewhere in between. Second, they only require one bowl to make and there’s no need to chill the dough. You can have these babies ready to bake in less than 10 minutes. They’re dangerously easy. Third, I’m confident they could hold their own in a competition with all of the white flour, refined sugar, butter-laden cookies out there. I brought them home for Christmas and my anti-vegan family members gobbled them right up. I’m telling you guys, the texture is unreal. Especially considering that they’re nutritious and much better for you than the standard cookie. In the bowl of a stand mixer with a paddle attachment (or a large bowl using a hand mixer) combine coconut oil and coconut sugar. Mix on high for 1 minute then add vanilla extract and almond milk. Continue to mix for another 30 seconds. With the mixer running add the almond flour first. Next add the oat flour, baking soda, baking powder, and salt. Continue to mix for about 20 seconds, until a dough forms. Using a spatula, scrape down the sides and bottom of the bowl in between mixing to assure all of the ingredients are combined. If the dough appears dry and crumbly, try allowing it to mix for longer. If it’s still crumbly, try adding a tablespoon of milk. Stir in the chocolate chips at the end with a spatula. Using a scooper or a spoon, scoop out about 1 and 1/2 tablespoons of dough at a time. Arrange them on the baking sheet with about 2 inches in between each. Bake in the oven for 12-13 minutes, until edges are light golden brown. Allow to cool for at least 15 minutes before serving. They will continue to firm up as they cool. Leftovers can be stored in an airtight container for up to 5 days. You can also freeze the balls before baking and bake from frozen when ready to eat. *If your coconut oil is rock solid, microwave it (without the lid) for 10 seconds, or until just soft enough to scoop. If it starts to get liquid-like then you will have to refrigerate until solid again. It’s very important that coconut oil is solid for the recipe to work properly. Vegan butter will work in place of coconut oil but the texture is softer with coconut oil. You can also use a combo of both, if you prefer. Sarah – these look perfect! I cannot wait to try them! Yum yum yum. May I please know the nutrition facts of these cookies they look stunning. Thank you. Hi! I made these cookies as a gluten free vegan, and I loved how simple the recipe is. 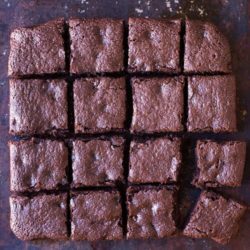 However, when I baked these, I used about a tablespoon each and they turned out very crunchy and flat, not like what you have pictured. Is it possible I over stirred the batter in my mixer? Or do I need to add more dough to each cookie for the denser outcome? Hey Sammy! I don’t think over stirring would cause them to turn out that way. The scooper I use is 1.5 tablespoons so unless you measured out a lot less then I don’t think that’s the issue. Was there anything else you might have changed about the recipe? Perhaps they cooked for too long? These are gorgeous! I told myself I was going to do some Valentine’s day baking and, of course, I bought a cake from Trader Joe’s instead lol. Whoops! They look SO beautiful! 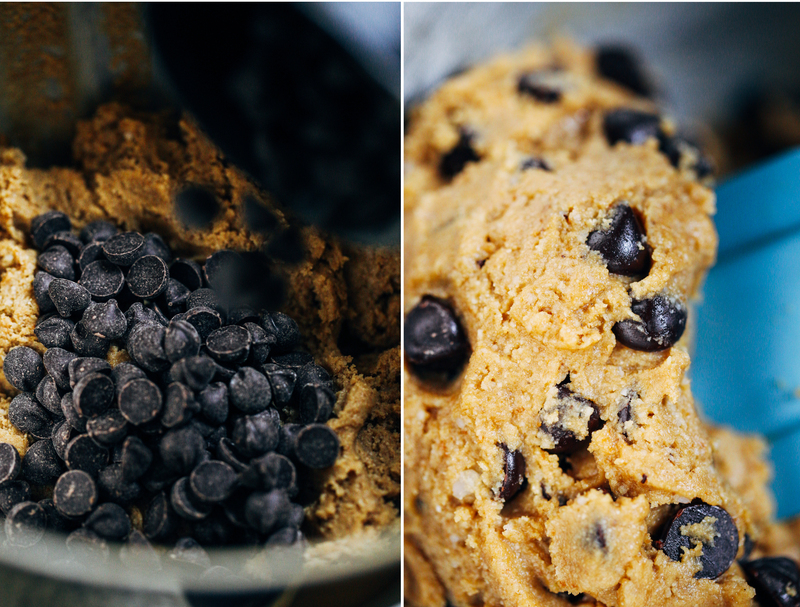 I haven’t made chocolate chip cookies in so long but I’m gonna have to give these a try! I love the ingredient list, too. These are sooo good! I did use almond meal because I can’t seem to find almond flour at my Whole Foods. They still came out delicious though. I will definitely be making these again and again. That’s so sweet of you to give us these cookies for Valentine’s Day! They look just perfect, and since they’re wholesome, I can definitely justify eating a few more than usual. I can’t wait to try them Sarah! Will this work with coconut flour instead of almond or maybe just more oat flour? Hi Jessy! I haven’t tested the recipe with either of those but my suspicion is that it would change the recipe since almond flour is entirely different from either of those. Let us know how they turn out if you give them a try! Would this work with a food processor or Vitamix blender? I don’t own a mixer…Thank you! Great timing, Sarah! 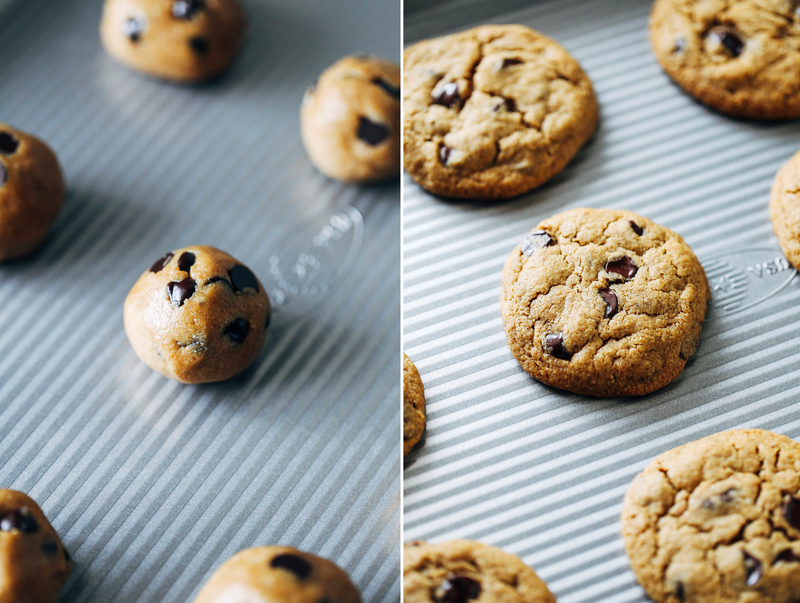 I just tried 2 other gluten free, refined sugar free chocolate chip cookie recipes. I love that this is made with almond flour! I’ll be trying it tomorrow! Is the dam leak anywhere near where you used to live in California? Do you know people affected by it? Hi Nancy! It’s pretty far north of where we were so thankfully we don’t know anyone who has been effected. It’s tragic and I can only hope the damage doesn’t get any worse. I made these yesterday and they are really awesome! I added 1/2 cup chopped walnuts – I love walnuts in my chocolate chip cookies. I went out and shoveled for our 5 major snow storm in 9 days, came in and made these wonderful comforting cookies. This recipe is a real keeper! Sounds like a perfect treat after shoveling all of that snow. Thanks Nancy! Sarah you’ve outdone yourself! I love these ingredients–oh so fitting since baking GF is on my to do list (after two recent fails, I’ve been putting it off–I need to “dust myself off and try again”) <–so lame, but it's true! Look at us, we are healthy cookie posting twinsies today! 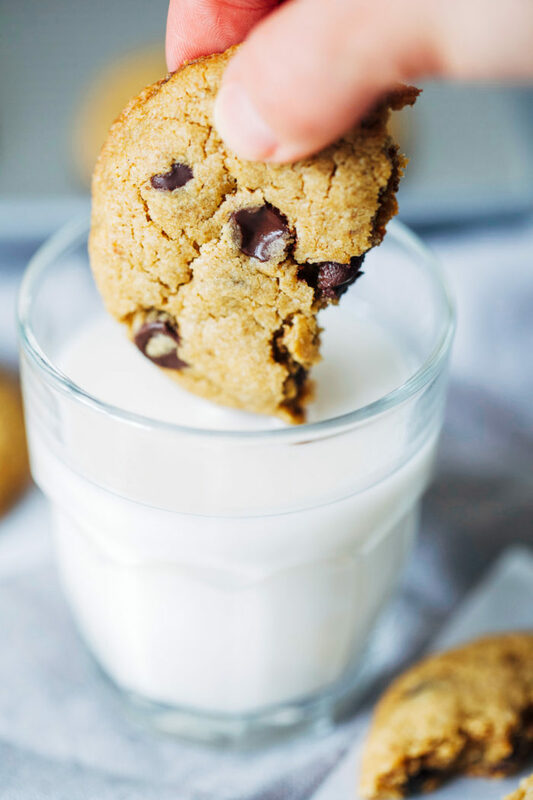 Great (dessert loving) minds think alike :) Sometimes a chocolate chip cookie is just the classic sweet tooth fix you’re looking for! Can i use honey or maple syrup? Is coconut sugar actually healthier? Hi Shirley! I used coconut sugar because it gives them more of a classic cookie texture. I haven’t tested them with honey or maple syrup but my suspicion is that it would change the texture quite a bit. As far as how it relates to health, I think it is a better option than cane sugar as it’s lower in fructose and contains more vitamins and minerals. The nutritional benefits are probably pretty similar to honey and maple syrup. But I like I said, I used coconut sugar to give them more of a classic texture. I hope that helps! I’ve made the blunder of confusing almond meal and almond flour before – wow – what a wonderful texture these cookies have! I’m so loving that these are so nutritious and vegan! I’ve had quite a few vegan cookies – but they always seem to over compensate with sugar – but these sound and look perfect! Happy V-day! Almond meal works the same but the texture is so much better with almond flour. I’m obsessed! I hope you had a happy V-Day too, Shashi! Aaaaaaagh these really do look like absolute perfection! I love the oat flour and almond flour combo and am 2000% on board with the coconut sugar and coconut oil – these two ingredients really do make an amazing treat! I say YES to a whole batch of these, please and thank you! Bring on that amazing texture and gooey chocolate! THESE COOKIES ARE MY LIFE GOAL!!!! omgah. The texture of these looks absolutely PERFECT! Chocolate chips cookies are my all time favourite cookie! I followed the recipe, but mine didn’t come out like a normal cookie dough. Hi Heather! Can you provide me with a little more information? Maybe I can help you figure out what went wrong. My texture was also not like regular cookie dough. It seemed too crumbly. Any suggestions? Hi Destiny! It’s possible that you didn’t allow the mixer to run long enough. I would try to run it longer and if it stays crumbly, add a little more milk. Maybe 1 tablespoon at a time. I hope that helps! I just made those with what turned out to be almond meal even though the label says FLOUR, but they still turned out yummy, albeit with a slightly sandy texture. My kids and I still love them! I’ll make another batch when I buy REAL almond flour. Thank you!!! I just made these cookies and they are absolutely delicious. Thank you so much for sharing. I’ve never baked with almond flour, oat flour or the coconut sugar. I am new to cooking and baking with these ingredients. I am now hooked. I also made your delicious Mediterranean Quionoa Casserole. This too was very delicious. I made these last night as I have been craving something sweet but didn’t want to eat anything bad. 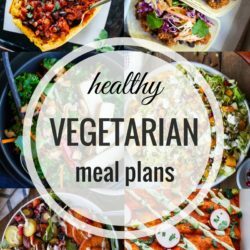 I have been eating plant based for about two months and really trying to find new recipes. These were amazing. Such a unique flavor with the different flours. I made mine a little smaller and did not have a blender so i did them by hand. Thank you so much for sharing your recipes. Hi there! I would love to make this recipe but I don’t have almond flour, can I use buckwheat instead? Thank you! Hi Melina! The almond flour is essential because of it’s fat content. Buckwheat would yield an entirely different result. I would recommend searching for a buckwheat cookie recipe or waiting until you can get some almond flour. I hope that helps! Hi Sarah, don’t know where I messed up, but these didn’t turn out crispy nor chewy like your molasses cookies did. The flavor was great but they were soft and never did harden even after letting them cool for a long time. Any thoughts? Hey Diane! Sorry to hear these didn’t turn out as well for you. Was your coconut oil solidified or melted? That’s the only thing I can’t think that would make big difference. These are proper cookies. They are sweet, chewy and have a crispy exterior. Not just good for a gluten-free vegan cookie, good for a cookie! This recipe is going in the keep pile. Thanks for this simple and delicious recipe. I love eating it as cookie dough and appreciate you sharing it! 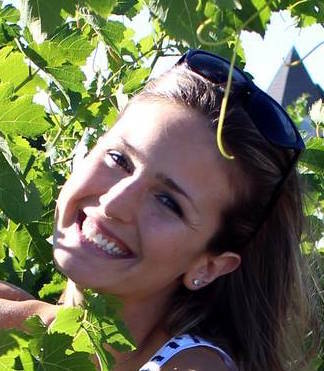 Thanks for your work with developing and publishing vegan + gluten-free recipes. So glad you like it! Thanks Beth! Wow. Really surprised how well these turned out. The whole family loved these, including the kids. A touch drier than regular cookies but great nonetheless. I didn’t have coconut sugar so I used sucanat and used a 1/4 cup since it’s sweeter. Also, I used 1 tsp of vanilla extract since the only milk I had on hand was Silk vanilla soy milk. The cookies turned out great despite the substitutes! Thanks so much. I’m so glad they turned out well for you, Kathryn! Thank you for the comment! These are the best cookies I’ve ever tasted in my life!! I’ve recently had to go dairy and gluten-free, and it has not been the greatest experience; mostly because I miss eating all my favorite foods. Finding the taste in gluten and dairy-free cooking has been challenging. Today I wanted cookies and this recipe came up I my google search. I’m in love. Seriously, if I could make out with these cookies, I totally would. Both of my sons asked for seconds, and told me they were the best cookies I’ve ever made. Thank you for this recipe and possibly saving my gluten/dairy-free life! I’m sharing this on my Next Life, NO Kids Facebook page and singing your praises all day. These are hands-down the BEST vegan and gluten free cookie recipe we’ve found! I’m embrassed to admit how many times we’ve made these over the past two weeks. Make exactly as written. Woo hoo! I’m so glad you love them as much as we do. Thanks Meghan! In NZ oats aren’t allowed to be labelled gluten free or used in gluten free foods (and my coeliac partner reacts poorly to oats anyway), can I substitute a different flour for the oat flour? Hi Charlotte! I haven’t tried any other flours but you could probably use GF all purpose flour or maybe rice flour? I wonder how you manage to keep these cookies together, not falling apart. Mine do not stay together, although I gave it good time to cool. Hi Mansi- it’s hard for me to know where things went wrong unless you are able to provide me with more information. Did you follow the recipe exactly as written? 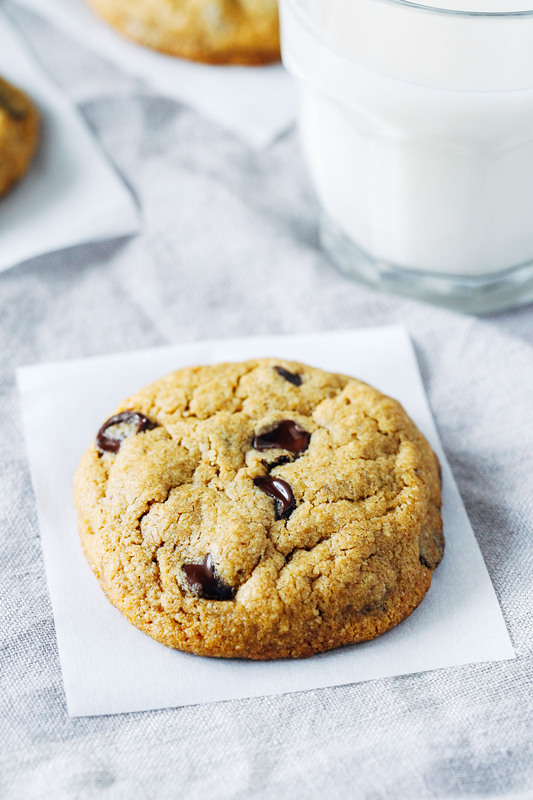 We’ve probably tried a dozen gluten free, vegan chocolate chip cookie recipes. Most have been edible, but this one was declared the winner! My son said that it was relatively soft and had a chewy, coco-nutty texture. No coconut so it must have been from the oat flour. I freeze them in batches of four. I did not deviate from the recipe except I used a locally available Ghiradelli chip which is vegan. Perfect. Almond flour tends to be a little gritty depending on how well it was milled so it’s possible that’s where the texture issue is coming from. 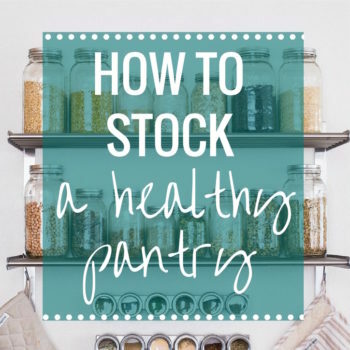 Running it through a sifter first can help solve that problem! Omg!! Just took first batch out of oven and absolute perfection!! Awesome recipe and easy!! Woo hoo! So happy they turned out good for you, Stephanie. Thanks for the feedback! Oh my god this is the best recipe!! I didn’t have oat flour on hand so used a standard gluten free flour blend instead. No dairy free choc either so I added 3 tbsp cocoa powder to make them chocolate cookies instead. They turned out AMAZING! Thankyou! I wish a could post pics they are gorgeous!! I’m happy to hear they worked with all of the changes, Dilini! Thank you for the feedback! I just made these for a neighborhood Block party. I am not gluten free but as a vegetarian I know what it’s like to go to a party and not have anything to eat so these seemed like a great idea. These came together super fast with a hand mixer. They don’t taste like Tollhouse because they obviously aren’t but they don’t taste different than any good variation of a cc cookie that is full of junk. Now I have a go to recipe when I need a delicious vegan GF dessert. Thanks! Hi, I just made your cookie recipe and it came out great! Can I freeze Cookies that I already baked. Thank you! Hi LaTasha! I haven’t tried freezing them after baking, only before, but I think it would work. Let me know if you give it a try! I always freeze my cookies in groups of two wrapped in Saran Wrap then placed in ziplock bag. That way people can just grab from the freezer. I just made these and froze them as well. I see no reason for them not to do well. If that changes, I’ll add a post. I don’t have the coconut oil. Could I use any other vegetable oil? I am dying to try this recipe. Hi Catherine! You can use dairy-free butter in place of the coconut oil. They might not spread as much but will still be good. Other vegetable oils will not work as they are not solid at room temperature. I hope that helps! Excellent recipe! Even my picky 12 year old loves them. Way more satisfying than a normal greasy cookie. This will be our go to cookie recipe from now on. I’m so glad they turned out well for you! Thanks Brandy! This recipe was awesome. I will definitely be making these again very soon. No need to make any changes to this already perfect recipe! Thank you. I love Miyoko’s Creamery vegan butter, but have not had success with baking cookies with it that don’t fall apart. Would you recommend that vegan butter in this cookie recipe, or do you think the coconut oil solidified would work better? I am really looking for a recipe that is vegan (eggless), and doesn’t fall apart. Thanks for your suggestions in advance. Hi Dianne! I’ve used 1/2 Miyoko’s and 1/2 solid coconut oil with good results. If you have both on hand, I would recommend trying that. It gives them more of a buttery flavor and they should definitely hold together. Thank you! And what about coconut butter? Last question, I promise. And I so appreciate you taking the time to answer my questions! I am gluten-free as well, and have used a GF baking mix that has organic sprouted brown rice flour, organic sprouted oat flour, and organic sprouted sorghum flour. Do you think I could use that in place of the oat flour? I saw your comment about substituting the almond flour, which you said would reduce the amount of fat in the cookie. So I won’t try to substitute that. I’m not sure why you would want to substitute the oat flour. I made my own by running oats thru a food processor. The cookies turned out fabulous! Probably because I caught a sale and bought more than 10 pounds of that gluten free baking flour mix! Lol. I just made these cookies and I’m so impressed. The texture is soft but slightly chewy. I’ve baked hundreds of chocolate chip cookies and people always request my recipe. But these are amazing and will be my go to from now on. I’m so glad you enjoy them, Darla! I really appreciate your feedback and your helpful responses to other comments. Thanks so much! Amazing! Made these for my children, and the entire family enjoyed them! Hii! For the total flour amount. Can I use 90% oat flour 10% almond? I only have less than half of almond flour left :(! Or can I use just oat flour? Hi Rama! The oat flour is much drier than the almond flour so using more of it will affect the end texture of the cookie. You can try it and see how it turns out but I can’t guarantee anything. Sarah, I finally made these super delicious cookies! And they didn’t fall apart! Thank you, thank you, THANK YOU for this recipe!!! I made these today and wow are they amazing! We’ve just started on our vegan and gluten free eating as a family and I needed something to make for guests tonight. These got rave reviews from everyone. I made one batch as is (except I only used 1/4 cup chocolate chips which I felt was plenty) and one batch I subbed a 1/2 cup oat flour with cocoa and they were yummy too, although they did spread out quite a bit more. Thanks for the great recipe! So happy to hear that! Thank you, Rama! Hi, I followed your recipe but my cookies didn’t spread like yours? Do I have to flatten the dough balls first before putting it in them in the oven? Thanks! Hi Quyen! You shouldn’t have to flatten the dough balls. Is it possible you might have needed to cook them for longer? They start to spread for me around 9-10 minutes but the time could vary depending on your oven. These did not work for me at all. At first, the mix was very powdery. I did them again and the batter seemed okay, however when I would bake them they would start spreading and not stop. I baked several batches, even made the size significantly smaller; and they all ended up the same way. They became a literal cookie sheet, not even cooked all the way through and incredibly oily. I followed the intructions to a t, I am a chemistry student and seasoned baker so I am just unsure what went wrong. Usually if the dough is crumbly that means it needs to mix for longer or you can add a tablespoon of liquid (milk or water). It’s hard to say where you went wrong when I can’t be in your kitchen with you. After further consideration I think it might have been the temperature of your coconut oil that was the problem. I’ve found that if it’s not solid enough then it will cause the cookies to spread too much. I would double the batch next time. I ended up making it twice. First as the recipe calls for and second, with organic cane sugar instead of coconut sugar. I also tried refined coconut oil instead of virgin so I’d get less coconut flavor in the end product. The second batch was much lighter in color and filled with more air. It’s a very flexible recipe and the second batch? No one would suspect they are gluten free and vegan. Thanks for the recipe. I’m so happy to hear they turned out well for you, Karen! And thank you for sharing your tips on the coconut oil! I just made these tonight! 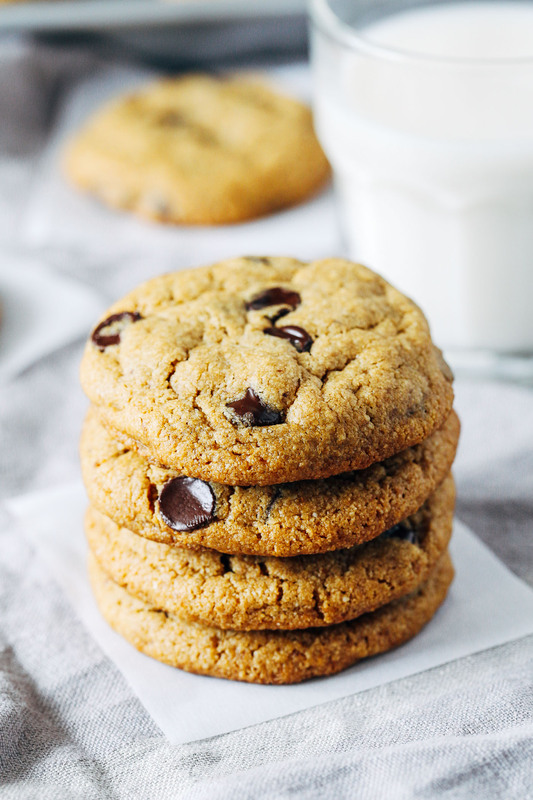 They are one of the best gf vegan chocolate chip cookies ever! I have tried some many other recipes but this one was the best! Thanks so much for sharing! I didn’t use a mixer because I currently don’t have one. I mixed it by hand with a whisk and a spatula! They still turned out so good! I’ll def try to use it with a hand mixer next time to try this recipe again! Thanks Kait! I’m glad you enjoy them! Everyone’s oven temp varies so it’s possible they may have need to cook for a little longer to spread. This recipe seems to be sensitive to how hot the oven is and how solid the coconut oil is. But I’m glad you enjoyed them anyway! I made these and… DANG!!! I used turbinado sugar because I was out of coconut sugar, added 1 tablespoon of Cacao powder, a 1/2 cup of Trader Joes mini marshmallows, 2 more tablespoons of coconut milk, and I blended oats into oat flour. SMORES COOKIES!! I wish they weren’t soo delicious. I can’t adult. Thanks for the fabulous GF & V recipe! I made them this evening using rice flour instead of almond flour and then instead of baking powder I used baking soda plus lemon juice. Then did my homemade hemp milk instead of the almond milk. They are perfect consistency, great recipe! I’m happy to hear they turned out with your substitutions. Thanks Sadie! I’ve never before written a recipe review, but these amazing cookies compel me to do so. I’ve tried a lot of vegan or gluten-free cookies before, but never one where I even wanted a second bite, let alone had a desire to eat the whole batch myself! How you managed to combine almond flour, oat flour and coconut oil and turn it into the delicious homemade chocolate chip cookies I remember from my childhood, I do not understand. The word “alchemy” comes to mind… They are simply magical, with their slightly crisp outer shell and the delightful chewiness of their centers. Oh my!! The final–and best–testimony was an unsuspecting taste test with my 21 year old son and his friends. I told them they could help themselves to the oatmeal raisin cookies (standard dairy and wheat recipe) on the counter, and I went off to bed. I woke the next morning to discover they’d found my stash of YOUR cookies and polished them off! These are carnivores who run when offered a “healthy” cookie–and when I informed them of what they’d eaten, they’d had NO idea!! They just thought they were awesome cookies. So there you have it! My eternal thanks for bringing real chocolate chip cookies back into my life. This has to be the best review anyone has ever written! I loved reading it and appreciate you taking the time to write it. These cookies are my absolute favorite and I’m so happy you share my sentiments. Best wishes for a happy new year! My daughter and I made these cookies tonight. We are enjoying them. My husband ate one and wanted to know how healthy they are? I want to add it is a great recipe without a an added starch. It is a truly simple recipe that creates great tasting cookies. I love Butter. My husband has been wanting to go vegan. I usually am the one that makes non vegan cookies! He made these. I am soooo impressed!!!! Thank you!!! They are delicious!!! One would never know they are vegan!!! Yay! That’s such a huge success for me. Thank you for your feedback, Abra! These look great. Just wondering if there is something else that could be used in place of the oat flour? Hi Stephanie! You can use wheat flour but I’m not sure what other flours would work because I haven’t tried them. Thanks for the feedback, Robyn! These are yummy! I will be making them again! These are the BEST cookies. I used the smaller bowl insert of the food processor with a metal blade. I used brown rice flour instead of oat, and 3TBLS butter+2TBLS coconut oil. I also smooshed the cookies flat when they were almost cooked because they were still in balls. Thank you!!! This is my go-to recipe now! These are fantastic!!! I used certified gluten free oats that I ground up into flour and almond flour. I had to use a little more almond milk to mix them up properly. I can’t stop eating them!! Thank you!!! Oh I almost forgot- I added a little sprinkle of sea salt to the top of each cookie after they came out of the oven and it brings out the flavor if he chocolate. So yummy!!! What could I use in place of almond flour and milk as I am allergic? 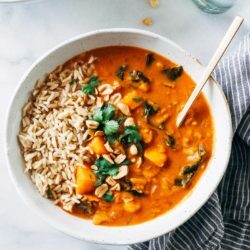 Would soy or coconut milk be an okay substitute? And could I just double the oat flour? Hi Al! Soy milk will work fine. I haven’t tried substituting the almond flour so I can’t say how that would effect the end result. Let me know if you give it a try! Just found these today and made them. They are absolutely delicious! I wouldn’t change a thing except to maybe flatten them a bit after scooping onto the cookie sheet. One of the best GF cookie recipes by far. Thank you!! That means so much! Thank you for the review! I’m thinking of making these but have a coconut allergy and oat allergy. I’ll sub vegan butter but am wondering between using all almond flour or substituting the oat flour with a rice flour. Which would be a safer bet? Either way I’ll let you know how they turn out. Hi Tatum! I think the rice flour would work better. If you can have wheat flour that would also work well. Thanks for the quick reply. I’m on my way to the store now :-) we have gluten allergies too. With 5 in the family (we’ve done testing for all) it’s hard to find recipes that work well for all!! I’ll let you know how it goes! I just made your cookies and they are indeed super delish!!! Thank you so much for the review, Bridget! I haven’t tried these with applesauce but my suspicion is that it would drastically change the recipe. I have another oil-free cookie recipe here: http://makingthymeforhealth.com/rips-oatmeal-raisin-chocolate-chip-cookies/ I will warn you that they aren’t as good as these but if you’re looking for a lower fat cookie, they fit the bill. I hope that helps! Thanks Sarah. I will try Rip’s cookies. I’m sure they aren’t as tasty as yours but I’m really supposed to cut the oil. I may monkey around with your recipe too- I’d love to be able to keep a reliable cookie recipe in my repetoire and these are just so yummy. I just made these (exactly accordingly to the recipe) and they are PERFECT!! Crisp edges, chewy insides, and subtly sweet. Thank you! These are by far the best cookies I’ve ever made. They are so buttery and rich that it’s hard to believe they’re vegan. I might not use any other recipes after tasting how amazing these are. I’ve had them with and without chocolate and they’re delicious both ways. Thank you for the amazing recipe! Good recipe with some tweaks. I was impressed giw “clean” the ingredient list was and i needed something gluten and dairy free so it gave it a go. At first, I followed the recipe to the letter and the dough was just a dry crumbly mess. I mixed it for ages and it didn’t come together. I added more almond milk and it still didn’t look right. So I added an egg and it started to resemble dough. One more egg and it was perfect. Not vegan, mind you, but still clean. Crispy outside, soft inside – so yummy! Thank you for sharing this recipe! So I made these and ate like 8 of them. Okay it wasn’t like 8 of them it was 8 cookies. ‍♀️ still SMH. They were that good. I actually substituted pumpkin flour because macro wise they’re pretty spot on with almond flour and we have but allergies that include almond in our house. I used earth balance in lieu of coconut butter because i just ran out yesterday when frying up sweet potatoes fries and then used organic sugar because I didn’t have any coconut sugar on hand. I will say do not add any salt if using earth balance. I always forget how salty that butter is. But obvi after eating 8 cookies it was pretty darn tasty. Why did you have to make this recipe? I’m going to be a fat kid!!!! Delicious!!! And SO easy! I’m new to baking and this was totally fool-proof! It says it yields 18 cookies but I followed the recipe and got 32. Which is good since everyone wanted extra! Also…two people in my family hate coconut and so I was worried they wouldn’t like these based on the ingredients…but there’s ZERO coconut flavor and my coconut-haters ate at least 4 cookies each. Tastes just like traditional chewey choc chip cookies! This is divine. I used “enjoy life” brand chocolate chips (just unsweetened cocoa and sugar) and 1/2 TSP almond extract instead of Vanilla (because I was out) … So good! Great recipe. I’m very grateful I have found your site. Everyone should make these cookies. I have and keep on making them over and over and over again. Simple, delicious and healthy. Thank you for the review, Joanna! Amazing! So easy and beyond delicious! The only thing I’m going to change next time is use less salt – 1/2tsp is way too much, 1/4 would be perfect. Otherwise, 5 star! Thank you! These cookies are out of this world! As a pastry chef I bake a lot and when I saw this recipe I could tell it was great but it was even more amazing! Congratulations and thanks for sharing! Wow, that’s quite the testament! Thank you for the review, Vanessa! These cookies are amazing. My son has an allergy to wheat and eggs, so its hard finding good GF/ egg free recipes. My gluten eating sons actually liked these cookies better than the regular wheat oatmeal cookies. Thank you so much for sharing this recipe! These cookies are easy to make and absolutely delicious! Thank you for the review, Valerie! Hi! So first time ever making vegan chocolate cookies. Had a couple issues one i accidentally bought coconut flour instead of oat flour and another we only had soy milk so i used soy instead of almond. They turned out very crumbly though :/ i kept adding more milk. They tasted great though thank you. Do you think adding the coconut flour made it more crumbly?? I tried this recipe tonight as my gf vegan hubby had some serious cookie cravings. I didn’t have all the ingredients, so I replaced oat flour with gluten-free flour and used almond meal instead of almond flour. They still turned out great – bit chewy, nice texture and excellent flavour! Great recipe, can’t wait to try it again with all the right ingredients. I’m happy to hear it worked with GF flour! Thank you for the kind review, Annika! Just made these this weekend and they are yum, yum, yum! Recently discovered I have a sensitivity to gluten, dairy, and eggs, so when I found this recipe I was excited. I followed the recipe exactly; the bottoms of the cookie got a little brown, but the cookie itself was delicious. I plan to make modifications on the cooking time. Will probably make these again next weekend! :-) #ilovechocolatechipcookies! I also added maybe 2-3 spoon of coconut milk towards the end to make the dough smoother. I’m so glad to hear they worked with your substitutions! Thanks for the review! Thanks for the recipe they were so good! I had to use the pillsbury gluten free flour instead of the other flours in the recipe and added a bit more coconut oil and almond milk so they wouldn’t be too dry but they turned out good! Thanks again for the recipe! Yum! I’m glad to hear they worked with your substitutions! Thanks for the review, Jess! I have just made these. I’m afraid I had to try 3, in quick succession – only to ‘test’ them, you understand. I’m from across the pond (England) and converted the recipe to grams. It worked very well, I have to say! Most impressed. I’ve been restrained and only baked a few (those 3, in fact) and have put the rest in the freezer. When cooking them from frozen, do we use the same oven temperature as before and what about the length of baking time? Thanks for broadcasting your lovely recipes. I shall be trying more. I always bake them at the same temperature and they usually take about the same time, if only just a few minutes longer. I hope that helps! You’re not treading on my toes at all, Charlotte! That’s very kind of you to offer. Please feel free to share them in the comments and I will reference it in the notes. Thank you!! I’m from India. Just made a batch of these cookies for a low fodmap diet I’m following. I am not vegan so I used regular salted butter instead of coconut oil and white sugar granulated instead of coconut sugar. Also used lactose free milk in place of almond. I used 50 gms butter, 100 gms sugar, 150 gms of a rice and tapioca flour with can than gum available in India, and 50 gms of whole almonds which I ground in a mixer with 50 gms of quaker oats. Just the milk used was about 70 ml to knead after whipping in the bowl. The cookies turned out very nice and everyone appreciated them. Thanks a ton for the recipe. They are crisp outside and slightly soft inside. I’m so happy it worked with your modifications. Thank you for the review! Mine came out strange, zero spread, dry and crumbly in the middle – almost sandy? I swapped out your flours for sweet sorghum and brown rice, is that where I went wrong? Also use used soy buttery sticks instead of coconut oil. Help? Yes, it was most definitely the flours that caused the problem. The almond flour is crucial to this recipe because it provides fat and moisture which sorghum and brown rice flour don’t. I recommend sticking with the recipe as it’s written for best results. Do you think I could replace some of the almond flour or oat flour for cacao (not cocoa) to make a chocolate, chocolate chip cookie? Hey Andrea! I’m afraid that probably wouldn’t work since cacao requires more liquid than either of the flours used here. You would have to experiment and change the recipe altogether. I’ll mark that down on my list to recreate though. Thanks for the idea! Hi! 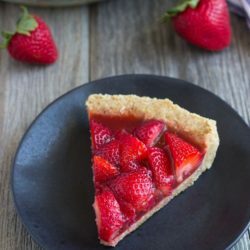 I made a similar recipe but it had can coconut cream instead of oil and all almond flour no oat flour I want to try this recipe out but add the coconut cream to replace the coconut oil. Do you think that will work? I haven’t tested it so I can’t say for sure but my suspicion is that it wouldn’t work the same. I’m sorry! Im not vegan, I’m not on gluten-free diet, but I love this recipe. It is so good. Of course it doesn’t have chewiness from gluten, but I don’t miss it or butter at all! I am definitely making more again. Aw so happy to hear that! Thanks Mikko! These cookies are fantastic!! Filled with good ingredients, incredibly quick and easy to prepare, and the recipe makes a small batch. This is an amazing recipe! Wow, such a simple and easy recipe for a gluten free cookie. The best gluten free vegan chocolate chip cookie I tried. Followed the exact recipe and these are the best gluten free vegan cookies I have baked so far. My kids love them. Thanks for such an easy recipe. Absolutely the best cookies. I was testing out chocolate chip cookies for the holidays and this recipe is hands down the best I came across. Crispy and just the right amount of sweet. I love not having to use flax eggs or egg alternatives. Thank you! I was sad when I recently went dairy and gluten free because I knew how much I will miss among other things…chocolate chip cookies. I am 0ne the few who ACTUALLY made these and let me tell you these cookies LOOK exactly how they look in the pics AND even better…they taste as good as they look. THIS is an AMAZING recipe, you are a vegan cookie GENIUS! Better even than original chocolate chips! they STAY most and chewy even the next day. Then by the end of they day they were all gone. 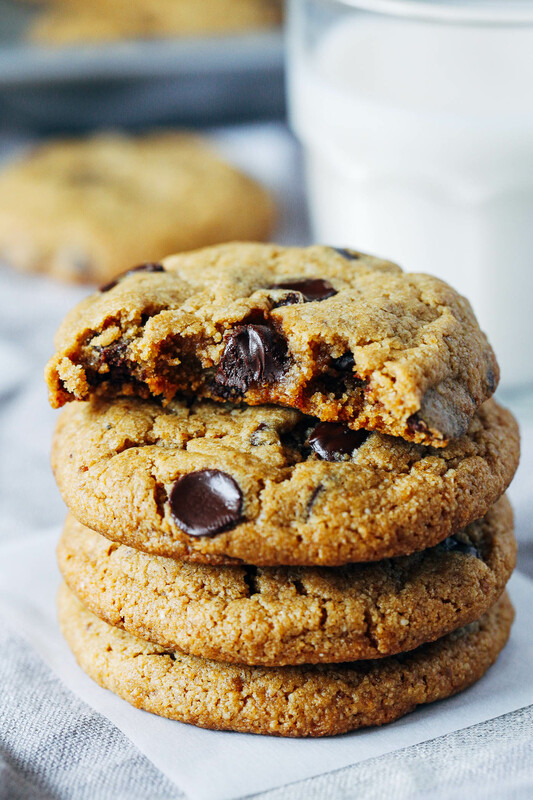 I have tried many other gluten free vegan choc chips and they were “meh”….THESE cookies need to go on the back of the dairy free chocolate chip bags ! A modern day classic! Thanks for, sharing this. Just baked and the cookies are yummy! Subtly dry but still delicious. Thanks for the recipe! Thank you! These are the best GF, vegan chocolate chip cookies I’ve ever had. My son asks for them to be made weekly. He is allergic to dairy, eggs, and gluten. Have you ever substituted the coconut sugar with Swerve or Erythritol? 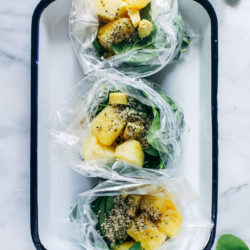 Hi I really wanted to try this recipe but almond flour/meal is hard to come by in my country☹️ Is there any other sub i could use? I’m sorry you can’t find almond flour, Cara! Unfortunately it is key to the recipe as it’s completely different from grain-based flours or coconut flour. You can try to make your own by blending blanched almonds in a food processor or blender until it forms a fine crumb. The texture might not be exactly the same as finely milled almond flour but they’ll still be delicious. Delicious! What a great recipe, I’ve made these twice.I would have never thought I could make a tasty gluten free and vegan chocolate chip cookie! Thank you! I know this is a vegan recipe but can I substitute the baking powder for 1 egg? Would I have to adjust anything else? This is such a great recipe! Not too sweet. I subbed the almond milk and coconut sugar with cashew milk and brown sugar and they turned out great! Added a bit more milk maybe a tablespoon and a half for more moisture. Thank you for truly the best vegan gluten-free chocolate chip cookie recipe! This was my first time making vegan/gluten free cookies and WOW! Such a great recipe and fantastic directions! I was able to find all of the ingredients at Trader Joe’s. Thanks for such a delicious and healthier variation on a classic! This recipe is amazing. So many vegan cookies are cake-like rather than like real cookies and this recipe did the trick! My husband and I ate a whole batch in two days, lol. I made them w/o the chocolate chips for the first batch, but now I’m going to use cacao nibs for this next go round. Thank you so much for sharing this deliciousness! We love these cookies! Do you think the dough could be made a day ahead and refrigerated until they’re baked? I just made these, and they are absolutely amazing!!!!!!!! My dad is gluten-free, and my mom is dairy free, so these are the perfect recipe! I”m so glad to hear that! Thanks for the review, Julianna! Hi there! I really want to try this recipe I am currently not eating any sugar but sugar substitutes. I also want to switch out the oat flour. Any suggestions? Would oat fiber be ok? I haven’t worked with oat fiber before so I’m not sure about that. You might be able to get away with brown rice flour in place of the oat flour. As far as the sugar substitutes, I’m not familiar with those either. I’m sorry I can’t help you more. I want you to have good results and based on your needs it might be best to look for a different recipe.